The seven-story, 167-bed hospital includes 59 intensive care beds, four operating rooms, two hybrid operating rooms, three cardiac catheterization labs and an electrophysiology lab connected to centralized research labs, and a center for graduate education. Stephen Whalen Photography. Building on Scripps Health’s legacy, the new Prebys Cardiovascular Institute in La Jolla, Calif., is conceived to be the region’s largest and most advanced center dedicated to cardiovascular care. The 383,000-square-foot tower, located on the campus of Scripps Memorial Hospital La Jolla, was designed by HOK in support of Scripps’ mission. Scripps marked the institute’s grand opening on Feb. 26, and began moving patients into the tower on March 8. 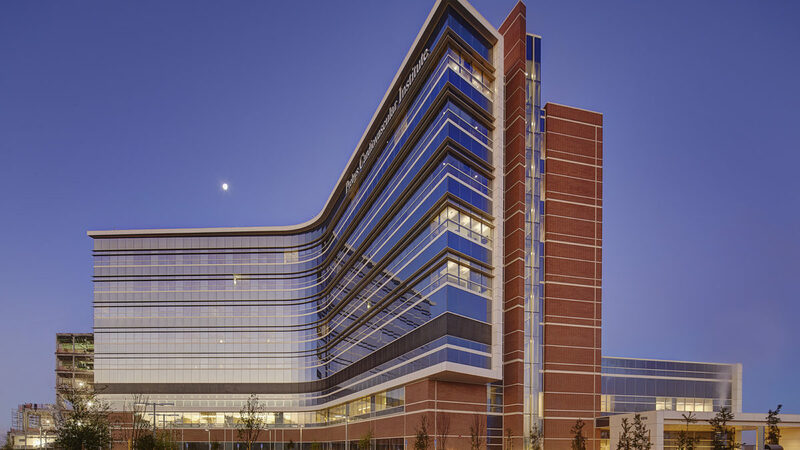 The Prebys Cardiovascular Institute builds on a legacy of Scripps advancements in pioneering surgical procedures, landmark studies, genomic medicine and wireless technology to provide the most innovative treatment options to patients with cardiovascular disease. HOK’s design team created a physical environment that embodies the mission and vision of Scripps with features that support the delivery of care, patient safety, staff efficiency, productivity and functional flexibility. The exterior composition of brick, glass and metal panels respects the aesthetic of the surrounding campus buildings. Stacked brick and punched windows lining the north and west facades relate to the La Jolla campus and its architectural character. The curved glass curtain wall on the southeast delivers a message of transparency to the community. Generous daylight on patient floors streams through the floor-to-ceiling windows. The seven-story, 167-bed hospital includes 59 intensive care beds, four operating rooms, two hybrid operating rooms, three cardiac catheterization labs and an electrophysiology lab connected to centralized research labs, and a center for graduate education. Interior spaces support advanced medical treatment, patient care, research, clinical trials and graduate medical education within an environment supportive of patient and family-centered care. The opening of the Prebys Cardiovascular Institute represents the first phase of a master plan that is transforming the Scripps Memorial Hospital La Jolla campus. The team included McCarthy Building Companies, Inc. as general contractor and Jacobs Project Management Co. as construction manager. HOK is a global design, architecture, engineering and planning firm. Through a network of 24 offices worldwide, HOK provides design excellence and innovation to create places that enrich people’s lives and help clients succeed. For five consecutive years, DesignIntelligence has ranked HOK as a leader in sustainable and high-performance design. ENR California named HOK its 2014 Design Firm of the Year.